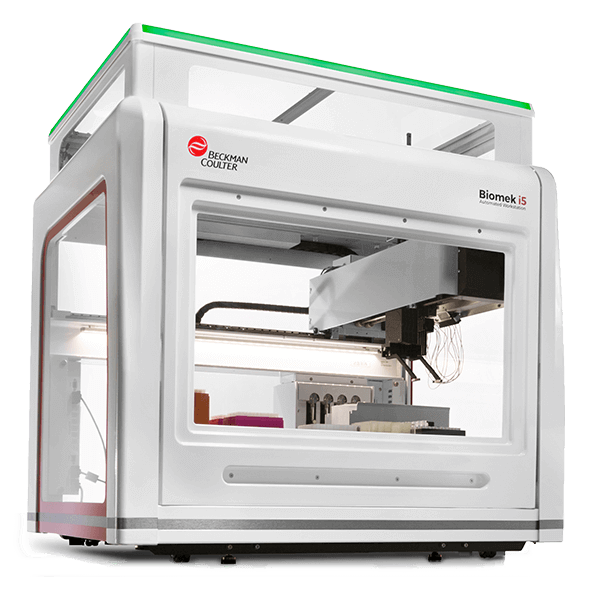 The Biomek i5 Multi-channel 96 Extraction Workstation is an ideal platform for medium to high-throughput laboratories looking to automate nucleic acid extraction. The multi-channel 96 pipetting and on-line 360 gripper enable flexibility and efficiency for full and partial plate processing. Standard on-deck process control elements such as shakers, peltiers and optional thermocyclers, enable significant reductions in hands-on time while also increasing throughput, productivity, efficiency. The industry leading Biomek software provides technology that enables Beckman Application Scientists and customers to create simple, yet comprehensive methods with unmatched intelligence and flexibility. A repository of demonstrated1 (definition of demonstrated as a footnote on the page) methods for Beckman's family of Agencourt SPRI- based extraction kits (hyperlink italicized text to Demonstrated Biomek Methods Card) is available. Each method comes standard with intuitive User Interfaces and tools like Deck Optix(TM) (hyperlink to Deck Optix) to better ensure accurate setup and reduce costly errors.